Environmentalists and climate scientists are united: we must take climate change seriously and reduce carbon emissions by diminishing our reliance on fossil fuels. But a pattern is emerging in Pittsburgh as it has elsewhere: neighborhoods depressed by one collapse or another renew themselves, then outsiders come and price out locals. Inequality’s many manifestations—housing biases, segregation, gentrification—has forced low-income people into polluted neighborhoods for decades and, even as we reshape our cities to prepare for the new future of energy, are threatening to do it again. In downtown Pittsburgh’s Waterfront building, Larry Schweiger, is among those happy to see the Steel City embracing change. Schweiger is welcoming, deep-voiced and, like a kindly professor, given to tangents about his upbringing in Western Pennsylvania and long career in environmentalism. Schweiger is the CEO of PennFuture, one of dozens of local non-profits helping the city transition away from steel and fossil fuel dominance. The clean energy industries provides 66,000 jobs in Pennsylvania, according to a 2016 report from BW Research. While solar and wind have both shown historic growth recently, according to the report, 80% of Pennsylvanian clean energy jobs are in energy efficiency, updating and restoring the state’s many historic buildings to make them more sustainable. Pushing businesses and homeowners towards energy efficiency and renewables could boost job growth even further, in addition to putting the city on the path toward its 2030 goal of powering all municipal buildings on 100% renewable energy. But Schweiger explains that, top to bottom, the hurdles are numerous. Anything boosting clean energy over traditional sources contradicts the Trump administration’s coal-revitalization messaging; the GOP budget calls for eliminating the federal energy efficiency program. (“Trump’s pulling the plugs out of everything,” Schweiger muses.) Municipal support is also precarious, he explains, because legislative hurdles surrounding building codes means energy efficiency isn’t mandatory in the city. Businesses may not want to foot the bill for it. But the problem of saying “we”—either a larger, global “we” or the policy community Schweiger refers to—need to do something is that not everyone can. Because the final burden, the one for most residents, is the simplest: money. In most cases, residents need to own their home before doing invasive work like re-figuring insulation or having panels installed, if they can even afford it. And in a city still recovering from the fallout of steel’s decline, those who would benefit the most from energy efficiency and cheaper energy bills from solar can’t afford it. Even in an energy transition, being poor is still expensive. A 2016 report from the American Council for an Energy-Efficient Economy found that low income Americans typically spend more of their annual income on energy bills than higher earning households. This only becomes more pronounced if the household is predominantly Black/Latino or if the house itself is rented instead of owned. In Pittsburgh, half of low-income households spend twice as much of their income on energy bills as higher earning households. Sighing, Schweiger recalls one woman in such a home, poorly insulated, sweltering in hundred degree heat, plugging her AC into extension cords overnight. Transitioning to renewable energy has clear potential to reduce pollution and even save lives, but what does it matter when those who need it the most can’t afford it? 20 minutes away, Millvale is the city’s most public clean energy success story. A series of floods nearly ruined the former mill town, first in 2004 following Hurricane Ivan and twice following heavy rains in 2007. 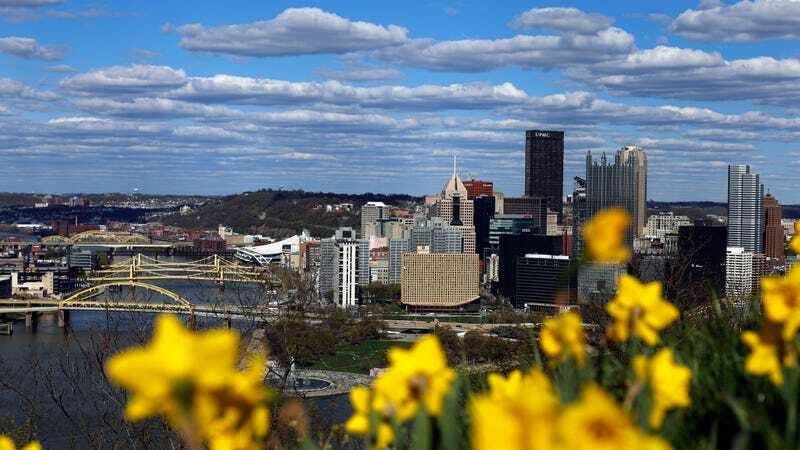 Already struggling with high unemployment and, despite requests, little financial support from officials in Pittsburgh, local residents rebuilt the area. With a series of grants from sustainability foundations, they converted an abandoned electronics repair shop into the local library, now equipped with solar panels and a fully functional garden. Restaurants and coffee shops sprung up, sourced from food grown just around the corner and staffed by Millvale residents. Now, the borough receives regular national acclaim from city planners, clean energy companies, universities and sustainability orgs. It’s a feel good story and one that Millvale’s sustainability coordinator, Zaheen Hussain, repeats often. By building a new sustainability system that harnesses the excitement for clean energy, but centers on equity, locals remained in control as it bounced back from the floods. Born in Bangladesh before immigrating to the US as a child, Hussain is a spokesperson both for Millvale proper and the need for a “fair” clean energy transition. “Another tour?” a local smirked as we pass a local diner. Millvale’s development followed the highly regarded Ecodistrict Pivot Plan. The plan sets dozens of guidelines, from setting caps on housing prices to ranking prospective businesses on sustainability and prospects for hiring locally, and building community land trusts, which prioritizes building new communal spaces, like a garden to ease the stressors of being a food desert or a community center for job training. Key to Millvale’s success, Hussain says, is making equity a pillar of its Ecodistrict plan. The borough’s rising profile has attracted multiple moneyed sustainability stakeholders. But without what Hussain called a “shared vocabulary,” residents aren’t on equal footing with the would be developers trying to transform their community. As a dark mirror to Millvale’s efforts, in nearby Lawrenceville, similar green-centered efforts are instead uprooting longtime residents. According to statistics taken from the Allegheny County Department of Human Services, there were 1,502 arrests in Lawrenceville in 2005 and only 502 arrests in 2015. Crime is largely a function of poverty. And while it’s decrease is remarkable, the city hasn’t eased stressors on the poor, but displaced them. A local report on the neighborhood’s growth says it now “has almost nothing left that’s affordable for the middle class, either to rent or buy.” In the same report, the city’s real estate and planning manager said nearly one-third of residential properties since 2012 have been bought by outside companies, not Lawrenceville citizens. As locals complained, Pittsburgh’s overall affordable housing and world-class technical breakthroughs from Carnegie Mellon and U Pittsburgh drew the attention of tech magnates like Google, focusing on machine learning and engineering, Uber, testing out driving-cars on local roads and Amazon, all with offices in the area. As was the case in Detroit, New Orleans, Brooklyn, etc., with this nascent tech boom came new developers pushing a version of sustainable neighborhood transformation that rose rents and pushed out longtime residents. The dynamics between gentrification, displacement and sustainability are subtle and shifting, but in an industrial city like Pittsburgh, which the American Lung Association ranked among the nation’s worst in air quality, neighborhoods making strides in air or water quality are pushing low income people out of their own neighborhoods and nearer to highways crossing the city, where diesel trucks spew black carbon and near industrial plants where housing is cheapest. A 1983 report from the Government Accounting Office found that minorities were more likely to live near pollutants like landfills. So did a 1987 report. And a 2007 report. And one last year. An inequitable clean energy transition is not only oxymoronic, it defeats its own purpose and functions the same as any form of inequality. If the clean energy transition isn’t fair or equitable, if it actually forces poor people into areas with worse environmental quality, then what really transitioned? Sharing an office with Hussain in Millville, a former social hall called the Moose Lodge turned sustainability headquarters, Dr. Kirk Jalbert is a data visualization expert with FracTracker Alliance, a research group tracking fracking and pipeline development. Jalbert spent years studying citizen science and environmental justice movements, particularly around water monitoring in rural areas. Having seen both the power of grassroots environmental campaigns and the skepticism they draw from institutionalized scientists, he sees the power imbalances within well-intentioned environmental spaces. The rural people who make up most of the state get left behind. In much of rural western Pennsylvania, coal mining communities are what Jalbert calls “mono-economies.” Coal jobs are the only jobs. Shifting to renewables without a plan for what will happen to people in these economies could be disastrous. Retraining them for clean energy jobs, should they choose them, is expensive and would likely require relocating. But coal mining is a largely generational occupation: most miner’s fathers were miners. That would mean families are essentially forced to leave communities they’ve been in for decades, yet another green-powered displacement. But because coal country backed Trump overwhelmingly in the election and generally support the GOP narrative that Obama-era regulations killed steel and coal, their pushback to a hasty transition out of coal is read as regressive climate denial. It’s complicated. Transitioning off fossil fuels will always be a collective effort, but Millvale’s success came from demanding equal footing with new stakeholders. Resolving the imbalances embedded into the fossil fuel system is paramount to a genuine transition. There are no easy solutions, neither energy nor home ownership have ever been equitable in this country. But, a neighborhood under transition should educate and encourage neighborhood education, demand communities well as commercial investment, and think longterm about affordability and efficiency. An inequitable transition shifts alternate power sources—wind and the sun for coal or gas—but maintain the imbalances that trap people in cycles of unemployment, environmental harm and a lower quality of life. It hurts both the rural and urban poor. While Jalbert supports championing renewables in the city, he thinks the transition isn’t extensive enough to reverse damaging social inequities embedded in the fossil-fuel based economy. Otherwise, the transition to reduce carbon emissions will accelerate inequality.